Trans Awareness Week Events! Plus, We’re being honored! As many of you know, next week marks the annual Trans Day of Remembrance, a time to honor community members who have been victims of violence or lost their lives. It is also “Trans Awareness Week” — a time to educate one another about the issues that trans communities face and our struggles for liberation. Members of DCTC are going to be busy, so be sure to come out and catch us at some of the following events! “The T in LGBTQA”: A Trans 101-style presentation at the University of Maryland. Contact us for exact location if you are a UMD student. Know Your Rights! Presentation with AU Queers and Allies at American Univeristy. MGC Room 203/205. Our regular bimonthly planning meeting at Whitman Walker Clinic. Trans Rights Seminar for legal professionals at University of the District of Columbia. Presented with UDC OutLaw. Building 39, Room 208. Founded in 2005, The DC Trans Coalition has done groundbreaking work here that has not only made DC safer and more equitable, but has led to changes around the country. Six states have used a model driver’s license policy pioneered here in the nation’s capital and championed by DCTC. Their work on prison policies and public accommodation access (especially with regards to public restrooms) has made an incredible difference for transgender people, and this is just the start of their many accomplishments. Please join us in honoring this all volunteer, community-based organization. The National Press Club is located at 529 14th St. NW, 13th Floor, Washington, DC 20045. We’ll see you there. Can’t attend? Please make a donation to support our ongoing work. Thank you so much to all who have already donated! Together, we are building a strong movement for transgender equality! 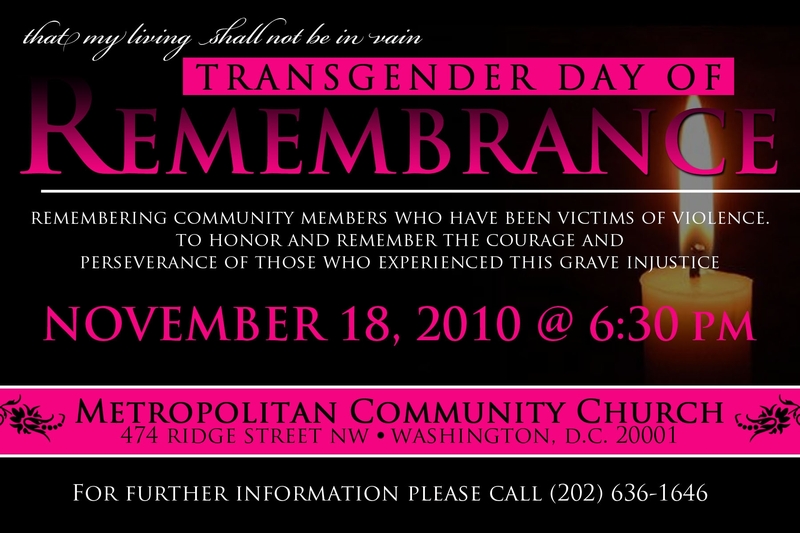 DC-Wide Trans Day of Remembrance at Metropolitan Community Church. See flier below for more info. Trans Day of Remembrance ceremony at George Washington University. Contact us for more info.